**This is a bonus reflection for Holy Week. On this day, the Saturday before Palm/Passion Sunday (John 12:12), Jesus is in Bethany (approximately 2 miles outside of Jerusalem; John 11:18) visiting with his friend Lazarus (you know, the one he raised from the dead? ; John 12:9) and Lazarus' two sisters, Mary and Martha. - This gathering may have been a special feast rather than a regular meal because Lazarus and Jesus were reclining at the table. This position was the common practice for banquets, rather than an everyday meal. - A pound is a large quantity of oil/perfume and would have cost the equivalent of about one year's wages. - Anointing Jesus' feet showed that Mary was humble and devoted to Jesus as she took the form of a servant. It is the servant's job to wash the guest's feet. Later in John, we see Jesus modeling servanthood as he washes the disciples feet (John 13). (Side note: Matthew and Mark, when relating this same story, say that Mary anointed Jesus' head with the oil. 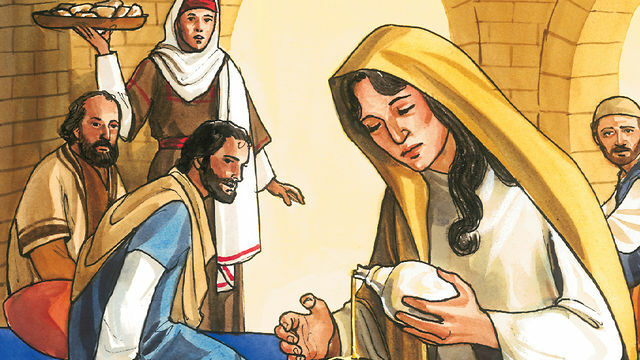 Given the large amount of oil, and the facts of the two stories, it is appropriate to consider that Mary anointed both Jesus' head and feet). Although those are great points to consider, it is Jesus' response to Judas that grabs my attention. His response tells me that our first and foremost responsibility is to worship Jesus. It is important to note that Jesus is not discouraging helping the poor. We know from Jesus' life and ministry that caring for the least of these is a very important function of Christ followers. The ministry of care, however, should never come before our worship of the One who calls us to that ministry in the first place. Judas is "concerned" for the poor by pointing out that the perfume could have been sold and that the money (remember, it was one year's worth of wages) could have been given to the poor. That's a lot of food and clothing. It's a lot of help with rent. This money could have been put in the benevolence fund. Now, Jesus knew that Judah actually wanted to steal the money, but that is not what Jesus calls him out for. Instead, Jesus makes the point that now is the time to worship. I firmly believe the lesson to be learned is that we must worship God first and then take care of others second. Or, as Jesus states in Mark 12:29-31, love God, then love others. As we worship God, we will increasingly become more like Him, meaning we will treat others the way Jesus treated them. It is vitally important that we become more like Christ...and we do so by worshiping Him. Today, spend time pouring out your love on Jesus.